As the 1970s gave way to the ‘80s, New York City’s party scene entered a ferociously inventive period characterized by its incredible creativity, intensity and hybridity. And such is the premise for a recently published book about NYC’s party venues in the early 1980s. 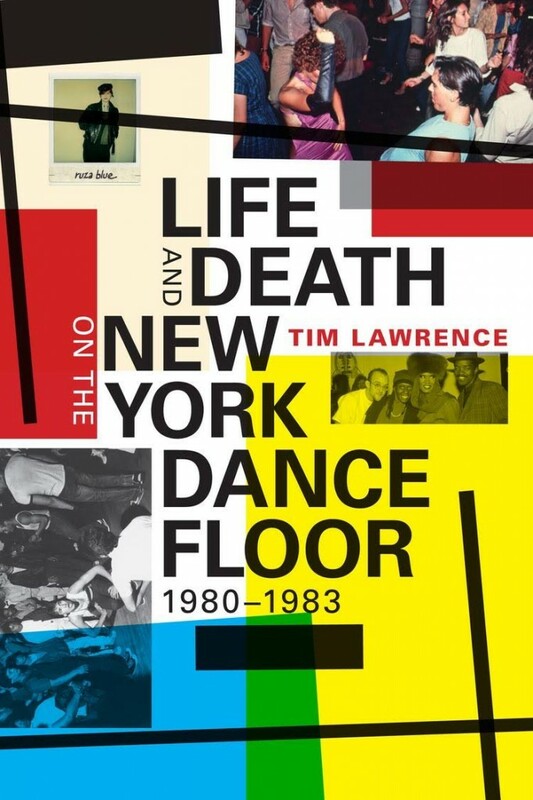 Tim Lawrence is the author of Life and Death on the New York Dance Floor, 1980-83, a book in which he illustrates how the relatively discreet post-disco, post-punk, and hip-hop scenes came to be marked by their level of plurality, interaction and ultimate convergence. We invited Mr. Lawrence to create a companion soundtrack to accompany his new book, and, over the course of three hours of carefully chosen tracks, he gave us an exclusive and well-sequenced look at those quintessentially New York grooves that helped to define an era. Additionally, you can check out the following short excerpt from his book, one focusing on David Mancuso and his highly influential scene at The Loft. The early 1980s have routinely been overlooked by critics and historians in favor of the sounds that dominated the 1970s and the second half of the 1980s: disco, house, rap and techno. But although disco is said to have died in 1979, with punk increasingly running low on enticing aesthetic ideas and rap’s then popular perception as being little more than a passing fad, the early 1980s produced one of the most productive and intriguing periods in dance music history. Then still cheap, still lightly regulated and still highly attractive to young musicians and artists, New York City drove the music scene forward as remixers and producers entered into a mutant period that brought together disco, rhythm and blues, funk, rap, punk, no wave, new wave and dub into an undeniably heady mixture of sound seemingly beyond categorization. Much of the music released during the 1980-83 period didn’t have a name. Nobody seemed to care. 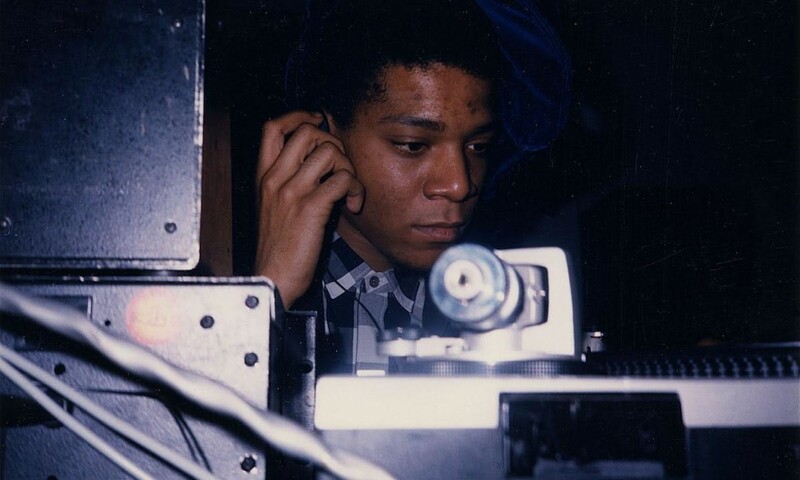 Jean-Michel Basquiat DJ-ing in the lounge at Area, 1986. Photograph by and courtesy of Johnny Dynell. Three scenes – the post-disco dance scene, the art-punk scene and the nascent hip-hop scene – underpinned the renaissance, with once staunchly divided revellers increasingly open to interacting with one another. This was in part due to the fact that the preeminent DJs of the era – Ivan Baker, Afrika Bambaataa, John “Jellybean” Benitez, Johnny Dynell, Grandmaster Flash, Bruce Forest, Jazzy Jay, Mark Kamins Larry Levan, Anita Sarko, Tee Scott, Justin Strauss and Roy Thode along with musical host David Mancuso – were all notable for their willingness to cross genre lines. 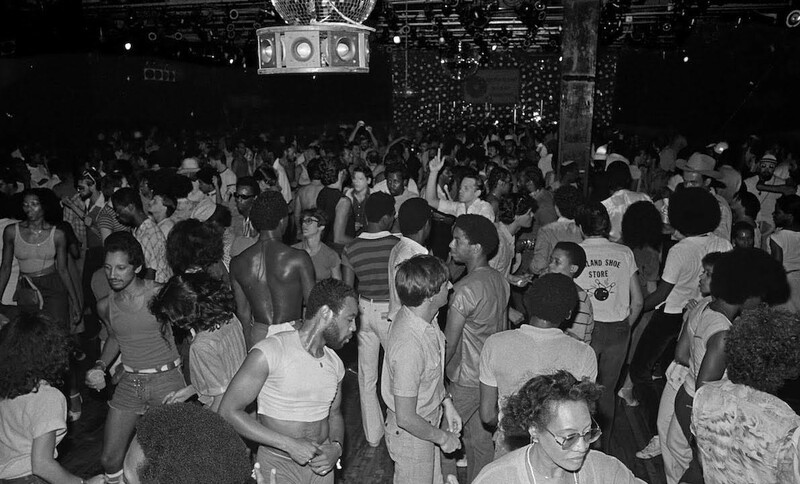 Meanwhile, party spaces such as Club 57, Danceteria, the Funhouse, the Loft, the Mudd Club, the Paradise Garage, Pyramid, the Roxy and the Saint took partying to new levels of intensity. In the end, a lethal cocktail of AIDS, crack and neoliberalism put the city’s party scenes on the defensive. As the decade progressed and they turned inwards, the level of mutation and interaction slowed down. It’s not as though New York’s musicians stopped innovating, but the high point of the city’s melting pot inventiveness really belonged to the opening four years of the decade. With genre then occupying no more than a passing thought, the early ‘80s were quite simply some of the most inventive and exciting years in New York City’s musical history. 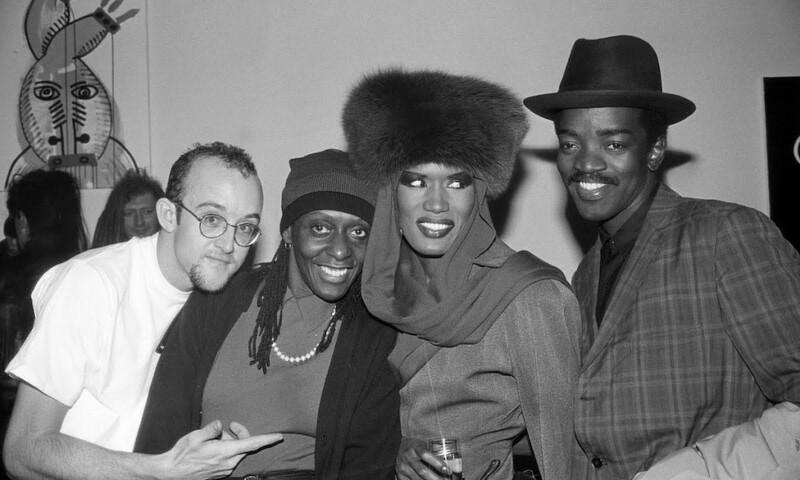 (Left to right) Keith Haring, Bethany Hardison, Grace Jones, Fred “Fab 5 Freddy” Brathwaite at the Fun Gallery, ca. 1983. Photograph by and courtesy of Ande Whyland. The Loft dated back to Saturday, 14 February 1970, when Mancuso staged a “Love Saves the Day” Valentine’s bash that synthesized a startling range of influences. The flight of manufacturers from downtown enabled Mancuso to move into a warehouse space at 647 Broadway and shape an expansive form of partying. The advances of the golden age of stereo enabled him to maximize the musicality and, it followed, the social potential of the party experience. The Harlem rent-party tradition that dated back to the 1920s suggested a community-based model of unlicensed, private partying that could be sustained by donations. The civil rights, gay liberation, feminist, and antiwar movements fed into the rainbow coalition identifications of his come-as-you-are crowd. And Sister Alicia, who put on regular parties for the kids she cared for in the children’s home where Mancuso grew up, inspired his unswerving desire to nurture an extended family of dispossessed dancers as well as his comforting use of children’s birthday-party décor. The Loft host’s balloon supplier must have counted him as its most lucrative customer. Going to the Loft provided Loose with his first experience of dancing “with blacks, whites, old, young, straight, and gay in the same room,” and he soon joined a “secret society” of Long Islanders who headed to the city every weekend as he wrapped up his shift at Blimpies at midnight, grabbed his bag, and headed straight to Prince Street. Mancuso’s party was the “complete opposite” of Studio 54, where dancers would buy expensive outfits in order to be somebody and narcissism reigned. “The Loft wasn’t about your dress and attire,” he explains. “It was about being communal.” Dancers wore functional T-shirts, military-style gas pants, and either Capezio jazz-dance shoes or five-dollar Chinese slippers. Many shredded the sleeves of their tees, threading beads onto the shred so they hung like braids. Some also attached an alligator clip adorned with a long feather to part of their clothing as an ornamental smoking accessory for when their joints burned down to the roach. “People dressed creatively and practically,” notes the dancer. Copyright Duke University Press 2016. Tim Lawrence is the author of Life and Death on the New York Dance Floor, 1980-83, as well as Love Saves the Day: A History of American Dance Music Culture, 1970-79 and Hold On to Your Dreams: Arthur Russell and the Downtown Music Scene, 1973-92. Since 1999 he has worked at the University of East London, where he teaches, conducts research and is a founding member of the Centre for Cultural Studies Research. He is also the co-founder of Lucky Cloud Sound System, which started to put on Loft-style parties with David Mancuso in London back in 2003.